We have arrived in Buenos Aires, Argentina!! In my last post, I mentioned that even though we've only recently returned to the United States, Tim and I had plans to visit Thailand again for 2.5 weeks from the end of October to mid-November. In addition to spending more time with the elephants and our friends at Elephant Nature Park, there was a very specific reason we were returning to the land of smiles so soon after our round-the-world trip ended. The following story is the reason why. Since I can remember I've always had a soft spot for those things that other people might not like as much. When I was younger, green became my favorite color because everyone else seemed to like the color blue. The number 8 with it's plump curves always seemed to lose out to the number 7 in popularity contests, and as such it became my favorite number. And whenever we'd go to the store, if it was time for me to buy a toy, I always chose the stuffies who were lying on the floor. I was afraid no one else would love them and take care of them like I would. I think Lek (the inspirational woman who runs Elephant Nature Park) does the same thing. She has a soft spot for the elephants who have been neglected and who are unwanted. In an industry that is focused on tourist dollars, Lek is focused on the well-being of her elephants. The elephants who are broken, abused, blind, crippled, and the ones who are cast aside...if Lek knows about them, she will find a way to bring them to her park so they can finally rest and be elephants again. But anyone who's ever been to the park knows it's not just elephants that she rescues. It's cats, and cows, and dogs, and – dare I say it – people too. As a result, the park is alive with activity: elephants trumpeting, cats meowing, dogs barking, cows mooing, volunteers chattering, and mahouts singing. It's a family, dysfunctional and fluid at times, but a family nonetheless and one that is filled with the stuffies who fell on the floor. For the Westerners who work at the park, the dogs are reminders of home. For the volunteers, they're great spider and rat catchers. For the park itself, they're great watch dogs. A few years ago, one of the dogs protected the park's cement mixer from being stolen in the middle of the night. He was stabbed by the intruder, but he was successful in protecting the park's property. And no worries, the doggy was fine and remains so this day. One of the most fascinating thing about the dogs is watching them interact as a pack. There are multiple layers of hierarchies, alliances and territories. With the new building constructed, Nong Chai and Nong Dom can claim the TV room, the back huts, and the bathroom area. But one small step outside their territory, and they'll be put in place by dogs half their size. Bobby, Max, and Silver keep a watchful eye on our friends Karl's and Michelle's hut, but aren't permitted by alpha female Copper and her sister Maddie to come up to the main hut. 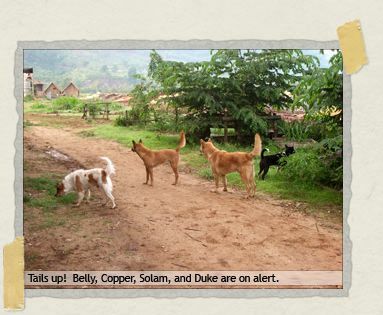 Number One, Number Two, Horace Silver, and Dahli keep watch at the front gate; while Bosie, Phet, and Nong Gi keep careful watch over our friend Jodi's hut. Silly Booboo loves the gift shop, chubby Poi loves the kitchen, and the bearded lady Mookie just wants to be petted. A picture of the dogs' territories would probably resemble a colorful world map. A flow chart showing the hierarchy would, with the exception of the lowest and highest members of the pack, be in constant flux. The dog captain each lower ranking dog plays under would, for the most part, remain the same. But the end result is a wonderfully fascinating doggy soap opera. We had been traveling for about 14 months when we had our first night at the park in late April. 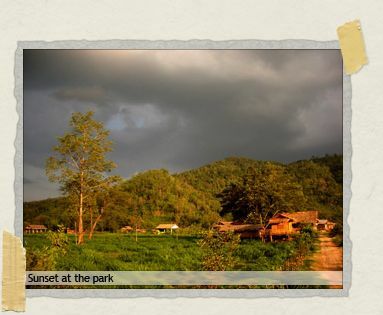 The weather in northern Thailand couldn't have been more gorgeous, and the park's location in the Mae Tang Valley meant cool breezes and fantastic sunsets over the surrounding jungle covered mountains. We had retired to our hut early (something we'd be endlessly teased about for the 7 weeks we volunteered) and were already dozing off to sleep around 9pm when we heard the familiar sound of doggie footsteps walking on the bamboo around our hut. It seemed that one of the park's dogs had followed us home. After a few more minutes, we realized there were actually four dogs who had followed us home and who were now snuggling down around our hut for the night. We had just finished talking about how nice it was to have doggies around, when the howling began. We were being treated to our first Elephant Nature Park howling session with, we would begin to learn, one of the lead singers right outside our door: Copper, the gorgeous alpha female of the entire pack. She was joined by Solam, a big bear of a dog; Duke, a sweet but lazy little dog; and Belly, a cute dog whose story we didn't know just yet. Giggling at their antics, we listened as their song lasted for several minutes. After the song had died down, we finally fell asleep, feeling safe and at home. Little did we know that that night, something was starting to change in our life. Over the next 7 weeks at the park, we busied ourselves with volunteer activities. Cleaning up ele poo, building fences and huts, prepping the fruit baskets for the elephants, and so on and so forth. Through a few random circumstances, I started leading the daily tours and, when I was on my Jumbo Express, Tim did the same. But of course the main thing that we worked on during our time at the park was creating the park's new website. Everything from designing and coding to writing and photographing, we did it for Lek and her elephants. And the fact that we were able to do that for her – after all the good she's done in this world – is something I will always feel good about. Weekly volunteers came and went. We grew remarkably close to several of them, especially those who stayed for longer periods of time. We became wonderful friends with Jodi and Karl, two of the Westerners who work full-time at the park. We wouldn't get a chance to meet Michelle (who was in Australia for most of our visit) until our last week and would quickly become wonderful friends with her too. We listened to Lek tell stories, we visited Elephant Haven, we bathed and fed elephants, we felt at peace. And we also started to fall in love. Predictably, dominating an animal through abuse can backfire. Any animal – dog, elephant, or otherwise – who would normally not act out or show aggression may end up doing so because they have become scared of their tormentor. As a result, you have a vicious cycle: person acts violently first, animal reacts defensively and scares person, person acts violently again, etc, etc. For dogs, it's often poking in the face, pulling on the tail, throwing rocks and sling-shoting them too. Sometimes it's much, much worse. And like any person, every dog has his own personality. Some tolerate the abuse, some don't. And some put up with it, but will always remember who has been mean to them. The life of most of the dogs at the park is heaven. There's plenty of food, plenty of land, and plenty of volunteers to give them regular petting. They've learned to avoid the very few mahouts and villagers who don't like them. 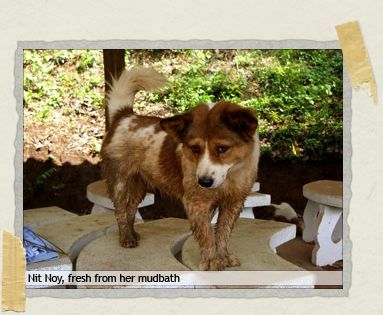 And, for the most part, the very few mahouts and villagers who don't like dogs have learned to avoid them too. But at times it's difficult. And for one dog in particular, life was becoming quite stressful. 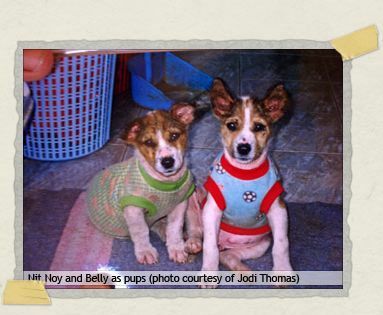 Belly and his sister Nit Noy were born around November/December 2002 in Lek's home village of Ban Lao. When they came to the attention of park staff, they were malnourished and covered with a horrible skin condition. When they were fed by volunteers for the first time, they both ate so much that their bellies expanded and their breath became labored. As so it was that Belly received his name. And Nit Noy, meaning "a little bit" in Thai, received hers because although her body was the same size as Belly, her legs were half as tall. It would take several years before they were both completely healthy. It's unclear what skin condition plagued them both, but plague it did. Sores developed and burst to the point that Jodi put little shirts on them so as to keep the bugs away. Belly would get healthier first; it would take Nit Noy a full year longer to grow the fluffy, healthy coat that she has now. And now, four years later, they have become excellent bug hunters: any bug that comes within striking distance will become lunch. My guess is they were so bothered by bugs when they were younger and sick, they don't tolerate them at all now that they're older and healthy. Who's to know why some dogs are abused and why others aren't. Perhaps it's size or a look in the eye or just bad luck. For Belly and Nit Noy, I think it might have to do with their appearance in their early years. Without their hair, they might have been awkward-looking to some. And with their numerous sores, they might have been gross-looking to others. Perhaps some locals were afraid of disease. Perhaps they didn't want the dogs with the bugs eating away at their skin near them. Whatever it was, Belly and Nit Noy became target practice when the volunteers weren't looking. Not all the time, and certainly not by everyone. But by a few people. From what we understand, they handled it differently. Nit Noy didn't want anyone at all coming near her, particularly during the time she was sicker than Belly. (It could be during this period the two of them drifted apart. As they grew older, they rarely ever hung out together, but whenever you did see them next to one another it was immediately clear they were siblings.) Now, of course, Nit Noy's totally different. She loves being petted and cooed over. And she'll give you a silly wiggle and funny grin when you sing her name to her too. For his part, Belly still wanted to be around people. 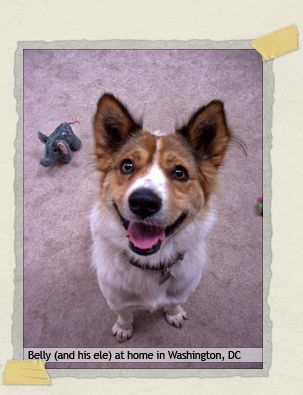 He followed volunteers everywhere with his happy smile, jaunty trot, and love for being petted. But he started becoming nervous if any of the mean people walked nearby. Usually he'd stay where he was lying on a bamboo bench, not make any movement, and just give a low growl: sort of a "hey, don't bother me, you stay over there, and I'll stay over here." Unfortunately instead of giving Belly his space, the mean person would often come directly over to Belly and start poking at him despite the growling. Before we arrived at the park, there was a particularly upsetting time when a villager threatened to kill Belly. In order to save Belly's life, Lek had to pay the man money. Unfortunately there were rumors that such a threat would be made again. Over the 7 weeks we were at the park, we watched Belly interact with everyone. 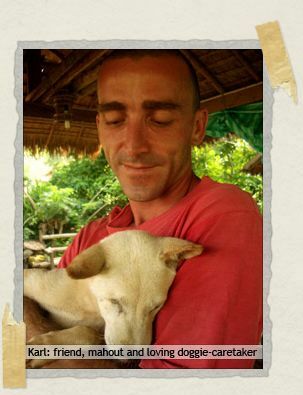 He loved volunteers, he loved the Westerners who worked at the park, he loved the mahouts who bathed him down at the river after bathing their elephants, he loved the cooks (he is, of course, a smart dog), and he loved Lek. But he became sad and stressed on those rare occasions when someone who had been mean to him before would come over and start taunting him. At times it was heartbreaking, more often than not it was maddening. And I have to admit I broke the socially accepted way of acting in Thailand by yelling loudly and gesturing madly more than a few times when it happened. Lek told us once that, "Belly expects to be respected. He does not like his tail pulled. He does not like rocks thrown. He just wants to be loved." After our first night at the park, there were few times that Belly wasn't near us. We noticed he followed us to the main hut each morning, and sat near us during meal times. During the elephant bath times he would be nearby, usually playing in the field with his doggy friends BooBoo, Duke, and Louie but sometimes getting a bath by Boonchoo, the lovely mahout for elephant Lilly. When we'd be working on the website in our hut, instead of playing outside with the other dogs, he'd be lying at my feet. Other dogs would go in and out of our room throughout the day, but he'd remain. At night he'd faithfully follow us back to our hut, more often than not without being prompted to do so. And if Tim was working on the website and I was up at the main hut, Tim would know when I was coming home because Belly would show up a minute before I did. We admired him as he hunted bugs in our room at night. We smiled as he ran happily in front of us around the park, always looking back to make sure we were still there. We interfered by dousing him with water whenever he'd become overly concerned about doggy territories and possible violators of said territories. We remained amazed as he slept soundly even when there were commotions going on all around him. We were amused when we'd see him eat bananas right under an elephant's nose...er, trunk. There are so many moments from our time at the park that stand out to me. There are so many moments that make me smile and laugh and cry. But there's one conversation that happened while we were there that started to change everything for us. It was around 6am and Tim and I were at breakfast. We love the early mornings at the park and most of the volunteers didn't get to the main hut until 7am or 8am. By going so early we were able to have some nice park time to ourselves, and to enjoy early morning conversations with Karl (who, because he's a mahout, tended to be at breakfast before 7am). This particular morning another volunteer who had been at the park for a few weeks longer than us was at breakfast too. It was about 2 or so weeks into our visit, and while talking to the other volunteer I commented how sweet it was that Belly followed us everywhere. We mentioned how we noticed other dogs would change which volunteer they followed home at night, but Belly always seemed to follow us. I mentioned how he almost seemed loyal. Raising an eyebrow and feigning surprise, the other volunteer remarked, "Really? None of the dogs of the park are particularly loyal. And I wouldn't describe Belly as being loyal at all." Quiet up to this point, Karl (who lives at the park and has raised most of the dogs since they were puppies) quickly interjected. "Belly? Belly's as loyal as they come. A lot of the dogs do great here with volunteers coming and going, but not Belly. Above all else, Belly just wants to be someone's dog. He just wants a family of his own." Of the 7 weeks we were at the park, Belly slept at our hut every single night. For 6 of the weeks he slept inside of the hut. And for 3 of the weeks he slept in our bed. If the mosquito net was down and he needed to go outside, he'd whine patiently until we lifted it for him. Then he'd trot outside, do his business, trot inside again, and back up on the bed. But most evenings he would sleep all the way through the night, curled up in a ball under my arm. For all we loved the elephants, and the park, and our friends, we loved Belly the most. And knowing that we would have to leave him – particularly knowing his story – was extremely emotional for both of us. The mere mention of leaving the park would make me start crying: not because I'd miss the elephants (although I would, tremendously), but because we would be leaving Belly. A few days before we were set to leave, I started talking to three volunteers who I later named "Belly's Angels." I explained Belly's story, and asked that they watch after him when Tim and I left. Although I knew Karl, Michelle, Jodi, and Lek kept a watchful eye on the little guy, I thought it didn't hurt to have a few other friends to make sure no one taunted him. Knowing they were there too helped make our impending departure a little bit easier. After we left the park, we spent a few hours later that night in the office with Jeff (another friend and Westerner who works at the park full-time) and Lek. Lek told us how after our van had left the park she had watched Belly look all over the main hut, follow our scent back to our hut, look around, follow our scent back to the main hut, look around some more, and then repeat the process again. Eventually, she told us, he laid down outside our hut's door and waited. Jeff told us the Belly's Angels eventually found him and spoiled him. Lek told us how much Belly loved us and how she noticed his coat had gotten thicker since we were at the park. It appears that we had helped to make his life a little less stressful. The days and weeks after leaving the park, I tried to repeat to myself that Belly would be fine, that another volunteer would inevitably fall in love with him again. But, almost without fail, I would usually start crying. For his part, Tim wasn't doing much better. It seemed the little guy had stolen our hearts. "We've heard it a few times before, so email me in two weeks, once you get home and are settled a bit. Let me know if you still feel the same way. Once your home and back in the real world, you might feel differently. If you don't, then we'll put a flag on him or something and make it official." It was the same night that Lek told us how Belly had searched the park for us. And our friend Jeff was talking with us about our adopting Belly. During our time at the park, we had talked extensively with Lek and the Westerners at the park about adopting him. (In fact, the idea was first suggested to us by Jodi.) Lek and everyone else were extremely excited about the possibility. And we were too: especially when we found out that as long as we could provide a vaccination record showing he'd had his rabies shot, that there was no quarantine for dogs entering mainland US. Two weeks later (I wouldn't be surprised if it was to the minute), we sent an email to Lek and Jeff saying if it was still ok, then we'd still love to adopt Belly. Upon receiving word that it was more than ok, we started planning. Several months passed, as did dozens and dozens of phone calls to Thai Airways, the CDC, the Department of Agriculture, the Thai Embassy, and a handful of other places we needed to check with before exporting a dog from Thailand and importing a dog into the US. At times the stress and the worry was overwhelming. A consistent stream of "what if" thoughts ran through our heads: anything from the distressed "What if something happens to him before we get there?" to the unbearable "What if Thailand doesn't allow us to leave the country with him?" to the unthinkable "What if he dies on the plane on the way home?" But we did our research, particularly with flight safety, and we told ourselves he'd be fine. He had to be fine. And so we were determined. Although we had just finished our round-the-world trip, we'd be returning to the park at the end of October for two weeks. And when we left, we'd be bringing a part of Lek’s family home to live with us in Washington DC. We just arrived home again last Wednesday. Our time at the park was nothing short of magical. 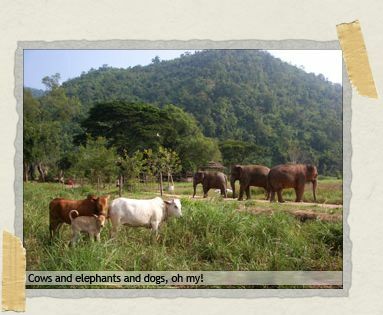 We had so many more memorable experiences with the elephants, with our friends, and with Belly. But those stories are the makings of another few posts. For now, let me just say, Belly is lying beside me as I type. He has his toy ele (who no longer squeaks) and his toy hedgehog (who, thus far, still squeaks) next to him. He's taken to his collar and leash like a duck to water. He did excellent on the plane ride here. He's discovered squirrels (including the one on our laptop when we watched Ice Age: he followed it with his nose, and promptly bit the screen). He loves his new dog park and riding in the car. And every day brings a new surprise for him. For us, watching him interact with his new world is nothing short of amazing. But most importantly, for him, he never has to worry about another person being mean to him ever, ever again. When we began our trip back in March 2005, we had no idea we'd be adding to our family in November 2006. 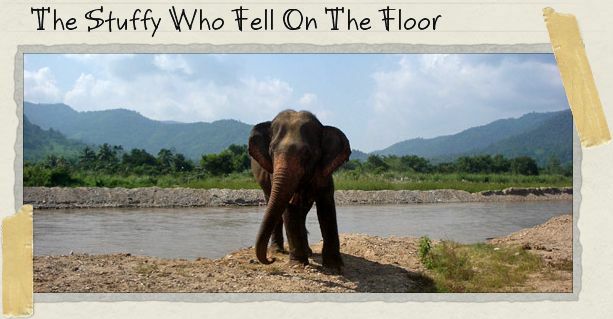 We had no idea there was a stuffy who fell on the floor in Thailand who was waiting to come home. But now that we know, it's hard to imagine that it wasn't meant to be. Welcome to America, Belly. You're finally home. Yay! This story got me a little teary eyed Congratulations! *Simp, simp, simp* May all the stuffies who fell on the floor be rescued and loved. May I also have the pleasure of meeting Belly someday. awww. belly, boy, you're so, so beautiful. look at that smile and those shiny eyes! i'm so glad you'll be there to take good care of my hedgies. amazing. fated. i love it. One of our dogs is a Rescue dog, but she's not an international rescue! Wow, what an amazing story! A friend posted us a link to this, I hope you don't mind the commentary. 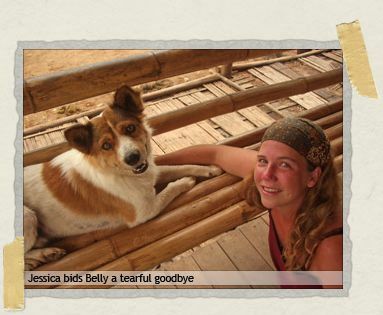 What a poignant story; I am so very glad there's a happy ending / new beginning for Belly and you! He looks like such a wonderful family member. Oh, this is such a wonderful story! I'm delighted that you guys have been reunited. Welcome to America, Belly! As I read this post, all I kept thinking is "Please let Belly come home with you!" Tears are flowing over hear. Welcome home Belly! Congrats to the new family! More tears here. Awwwwww. OMG so cute. You guys totally surprised me – this is not what I thought AT ALL. But I LOVE IT. So amazing and wonderful and sweet. The family photo is the best. Beautiful, wonderful story. Fingers crossed that I get the opportunity to give him ear scratchins on day in the future. We're so glad you've added to your family– again, I am one of the many folks around the country who you've managed to make get all teary-eyed in the office! Thanks for keeping up the posts– those of us who have retired from the travelin' life(for now!) have been living much more richly through your wonderful website. Makes sense to me (amid the tears). Love to you both and many long years of wags. hey, how are you guys doing? what about those fabled tuesday postings? hmmmmmmm? give me a call so i can help belly chase squirrels. Hey lady! How are you? We're doing quite well indeed and so is Mr. Belly. He and our kitty China are getting along quite smashingly too, so it is domestic pet bliss in our little household. However, the jungle-dog is none to pleased about our weather as of late. what about those fabled tuesday postings? hmmmmmmm? Coincidently, I've been seeing hedgehogs everywhere – toys, pictures and so on – I think you've started an international trend. Scratch Belly behind the ears for me and hello to China too. This story has only come to me tonight and it is wonderful to know that here is so many caring people out there. Give Belly a kiss from me and my two dogs Janet and Zoe. The angels were truly looking after him. i finally had the time to look for the belly story, which i knew was in here…jess, you are such an awesome writer! 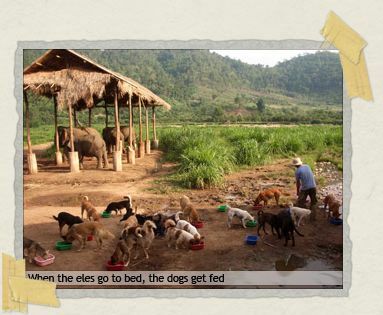 i am now sitting here in michigan all teary eyed, missing my special dogs johnny, james bond, noungee, bozie, even phet, who has moved up to the new mahout village,(and park life in general!) and getting excited about seeing the bellster again! Belly really hit the dog lotto! I visited the Elephant nature park, last year and was besotted with Belly. We let him in our room one night but he was very restless. When I heard a friend of mine was going out to the nature park again this year I asked him if he could give Belly lots of fuss for me. He told me Belly wasn't there and thats how I ended up here. Belly's a lovely dog. It brought a tear to my eye reading you're story. I'm so glad that he will be so well looked after. 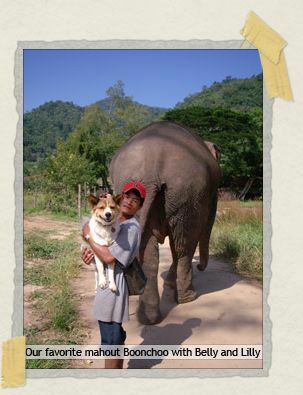 I visited the Elephant nature park, last year and was besotted with Belly…Belly's a lovely dog. Awwww! That he is, indeed. And any friend of Belly is a friend of ours too. You'll be happy to know that the little guy is doing better than ever. It's almost a year since he's come to America and he's never been so fluffy before. He loves his sister (a cat named China) and he has more toys than I can count. He is incredibly, incredibly happy at home in America and we feel so lucky to have him here with us. Thank you so much for commenting, Ed. That really made us so happy. And Belly says woofity woof too! I visited the Elephant Nature Park in May and had an absolutely amazing time there. We were there for just one day (didn't know yet about the option to volunteer) and I could hardly drag myself away.. 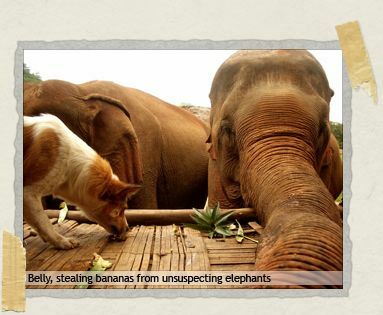 I am pretty sure we have a photo of Nit Noi stealing a banana from an elephant. Your story is so familiar. I rescued a little dog from a Burmese construction camp in southern Thailand last winter while I was living and working in Khao Lak. She had the same skin/fungal problems as Belly I think. She has made it back to Washington DC with me, has grown a fluffy red coat, and is living the good life here. Adjusting to winter! 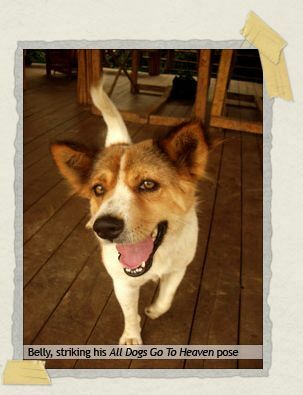 Want to get together sometime, introduce our Thai dogs and share stories? Sorry this is a bit random but I can't help but write! 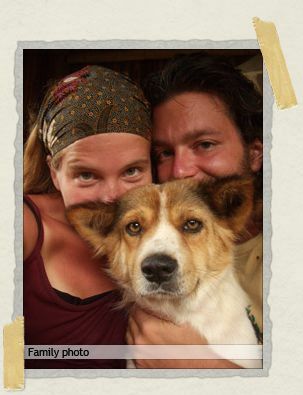 Want to get together sometime, introduce our Thai dogs and share stories? Sorry this is a bit random but I can't help but write! Ohhh, how wonderful! I'm so glad you commented! Your story made both of us smile. (Belly wagged his tail appreciatively too.) We would have absolutely loved to have gotten together…but at the beginning of December 2007 we moved away from DC and up to Massachusetts. Any chance you'd be headed this way for vacation in 2008? Can you contact me with your e-mail address. I want to get permission to use some of your photos and tell the story of you both and Belly in a book I am writing. You wont remmeber me but I was there on the first day of your visit to the park, it was my birthday and then in November of that year we meet up again on the day you were leaving to take Belly to the USA. It is a story that I have never forgotten. So if you could e-mail me that would be great so I can discuss more. Hey Julie! We definitely remember you! Thank you so much for your lovely comment. It really means a lot to us that you've remembered Belly's story. Jessica, this is such a wonderful post and your writing is so moving. As dog lovers, we have the hardest time watching animals being cruelly treated in other countries. I am so, so glad you rescued him and wrote all about this. Awww, thank you so much for this comment, Akila. You really made me smile.